Unlike other hoof formulas which rely on paraffin, vaseline or silicone which the hoof can not absorb. Instead, Kevin Bacon’s uses Laurel leaves infused in natural grease from animals that is easily absorbed by the hoof! 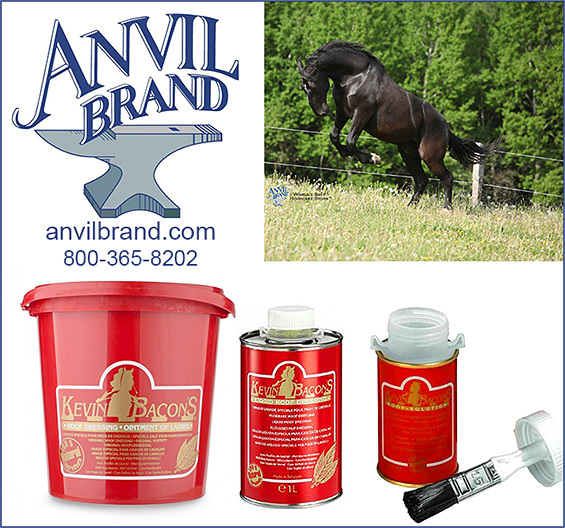 Anvil Brand Shoe Company has been manufacturing horseshoes, farrier tools and hoofcare products since 1978. We have horseshoes and hoofcare products on the Budweiser Clydesdales, Sea World and Disney horses, and famous hitches belonging to Express Personnel, Ames Construction and the Heinz hitch. Our reputation for quality products and superior service is unsurpassed. Our decision to become the exclusive USA Dealer for Kevin Bacon’s Hoof Dressing was based upon our desire to carry the very best in hoof care products. Kevin Bacon’s makes a completely absorbable, all natural, hoof dressing that offers extremely good results. We simply are the World's Best Hoofcare Store™ and are excited to bring this to our American clients. How Did Kevin Bacon Decide To Formulate This Incredible Hoof Dressing? Says creator, Jean Jacques, This ointment originates from the time when I myself owned a horse which was suffering from an avulsion fracture of the front right heel. Unable to find any products on the market to heal it, we teamed up with several friends who are vets, homeopaths and chemists and carried out some research, which gave rise to Kevin Bacon's, a 100% natural and traditional product based on animal fat, vegetable oil and fresh bay leaves. Today Kevin Bacon's is sold just about everywhere in Europe and is regularly used by the best riders in the world. Note: Kevin Bacon's is highly valued by prestigious trotting and racing stables as well as by show-jumping and dressage professionals. During the last Olympic Games, more than half the riders chosen for the show-jumping final used Kevin Bacon’s. How Did It Come To Be Called “Kevin Bacon’s” ? In 1984 Jean Jacques formed a partnership with his good friend Kevin Bacon. Kevin is an internationally renowned Australian jockey was so impressed by the Hoof Dressing that he wanted to put his name on it. Kevin tried the Hoof dressing and found it to be superior to any he had used before . An agreement was made and Kevin Bacon agreed to represent the product and to find distributors around Europe. After a few years of selling the product to show jumpers and horse people active in the industry, people just started calling it “Kevin Bacon’s”, and the name has remained ever since. Kevin Bacon’s Hoof Dressing is based in natural, easily absorbable animal fats that have been steeped with Laurel leaves to create a Laurel balm for the care and protection of horses' hooves.Good hooves call for the use of top quality products, for one, to keep them supple elastic and balanced. Kevin Bacon’s Hoof Dressing is applied in a thin layer and absorbs completely after it is applied from coronet band on down to cover the entire hoof. Kevin Bacon’s Hoof Dressing has been manufactured by traditional methods for more than 25 years, reflects just this philosophy. This is a 100% natural product made from animal fat and fresh laurel leaves that have been macerated to release their active substances. Laurel leaves naturally stimulate hoof growth and help to strengthen and condition the hoof naturally. Note: A Superior Hoof Dressing does not merely give the horn a pretty shine. It penetrates the horn to nourish the hoof deep down. Many competitors will warn “do not get on the coronet band” with Kevin Bacon’s you can apply all over the hoof and enjoy wonderful results! What Can I Expect From Regular Use Of Kevin Bacon’s Hoof Dressing? Regular use of Kevin Bacon’s Hoof Dressing prevents the hoof wall from drying, protects it from the wet, and activates horn growth. All of these properties make this a remarkable product that is used and recommended by all riding professionals. Is It True That Kevin Bacon’s is FREE From Tars, Paraffin, Vaseline That Competitors Use? Yes! You will be amazed that our products absorbs completely in minutes and readily nourishes the hoof. Is It True That Kevin Bacon’s Also Offers A Liquid Hoof Dressing? Yes! The Liquid Hoof Dressing will minimize hoof cracks can be applied to the wall AFTER shoeing to prevent the penetration of bacteria into the hoof. Our Liquid Hoof Dressing contains essential oils of the Neem tree, which grows in India whose antiseptic and antibacterial properties are very impressive. The results on the hooves are incredible— Kevin Bacon has a medical background which helped in the formulation of these products. How Often Should I Apply Kevin Bacon’s? Normal usage is 2 times per week— but in the event of severely dry hooves, 3 times a week will work wonders. Kevin Bacons Hoof Dressing Is Only $17.60 and Liquid Dressing Is Only $28.10-- So Order Today! You will see why the top riders in Europe depend upon Kevin Bacon’s Hoof Products for their horses. Kevin Bacon’s hoof products are very reasonably price and offer truly superior results. Give us a call— we are happy to help you with your order today!